We have finally arrived at the end of the road with only the Final Four teams remaining in this college basketball season. As usual it has been an exciting tournament with a flurry of insane finishes after a pretty uneventful opening weekend. After all the madness we now have just Texas Tech , Michigan St, Auburn, and Virginia hoping to be crowned the champions in Minneapolis. The first game on Saturday is set to tip at 6:09 from U.S Bank Stadium in MN and it features the #1 seed Virginia Cavaliers against the “dark horse” 5th seed in Auburn. Virginia has had the easiest road of anybody to get here having beaten Gardner Webb, Oklahoma, Oregon and Purdue to get out of the South Region. The Purdue game was on the short list for wildest games of the tourney as Carson Edwards couldn’t miss and Virginia had a miracle bucket at the end of regulation to send the game into OT where they prevailed. I’m rooting for Virginia so there is some bias in how I view this team , but I really thought they hung in despite some unlucky breaks via crazy 3 pointers going in vs Purdue. Obviously they leveled the score with the miracle finish , but they seem ready for this moment and I like the matchup they get with Auburn. Virginia isn’t a dynamic offense by any stretch , but they aren’t the team from the past who if they fell behind were unable to climb out and were practically dead. Kyle Guy and Ty Jerome are an experienced backcourt who bring stability to the entire unit, and are deadly from behind the arc. On the inside Hunter is a legit NBA prospect and with Auburn a little thin due to injuries I would expect him to have a bigger game than we have seen in the past few rounds. Virginia is always defensively sounds and their ability to limit 3 point shooting will be the key in this one. Auburn is a giant slayer having knocked off Kansas , UNC and Kentucky during this impressive final four run. Chuma Okeke going down to a torn ACL in the middle of the run was a gigantic blow and even though they were able to survive without him vs Kentucky it is a major strain on their rotation. Auburn loves to make the game chaotic and they shoot a ton of 3’s which always gives them an out if they can get hot from deep. The problem for them is Virginia is one of the best in the country at limiting 3 pointers and as I just mentioned I think that is where the game will ultimately be decided. I lean to Virginia here despite the fact you have to lay a good amount of points if you are betting this spread as i think that Auburn’s run finally ends. The loss of Okeke is going to force Harper and Brown to do the heavy lifting and Virginia matches up great with them making this seem like a problematic spot. Hunter on the inside should have his way and I think this is a situation where Virginia may really set the tone from the opening tip in route to a relatively easy W.
The second game of the doubleheader and to me the tougher of the two matchups between Texas Tech who won the West Regional against Michigan St who was the champions of the East Region. Texas Tech took down #1 seed Gonzaga with their relentless defense while Michigan St was the team who was able to end Duke and take out the heavy favorite in this tourney. On the Texas Tech side we have Jarrett Culver who leads the Red Raiders and contributes not only on the offensive end , but on defense with an ability to rack up the blocks and steals. He is going to have to find ways to be effective despite Michigan St throwing multiple bodies at him and having plenty of bigs to deter him inside. This Spartans team is experienced and certainly battle tested so TT will have their hands full on both sides of the ball. However as I’ve mentioned all tournament Texas Tech has the best defense in the country and Michigan St is going to have to find ways to get quality looks or they will be in the same situation as Michigan and Gonzaga. 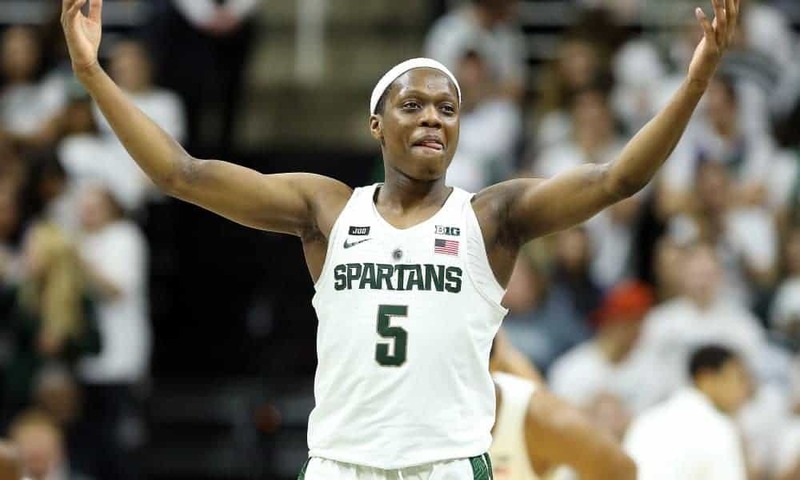 For Michigan State to advance to the title game they are going to need Cassius Winston to lead the charge as the Spartans rely on him early and often to set the tone. He has plenty of options around him with a handful of bigs and wings that can all stretch the floor from 3 and also attack the glass for offensive put back opportunities. This should force Texas Tech into some difficult decisions on who to prioritize on the defensive end , but against Gonzaga they were able to be disruptive despite all the firepower that offense has. When Michigan St shoots a good % from three they become incredibly difficult to defend and open up driving lanes for Winston which is where he and this team is at their best. Izzo I’m sure will have a gameplan that is centered around Winston and it will be interesting to see how TT coach Chris Beard tries to counter that offensive gameplan. This is the final four and as the spread shows this game is expected to be a nail bitter right down to the end. We know these are both hard nosed teams who aren’t going to be remotely intimidated by the atmosphere and will get after each other on both sides of the ball. Similar to the Gonzaga game I think Texas Tech’s fate will be decided on if they are able to get enough easy buckets and not have to lean on the 3 ball which they aren’t particularly known for. Culver is going to need to lead the way and if he does TT has a great chance , but ultimately I think Michigan State will do just enough to survive and set up a Virginia-Mich St showdown.